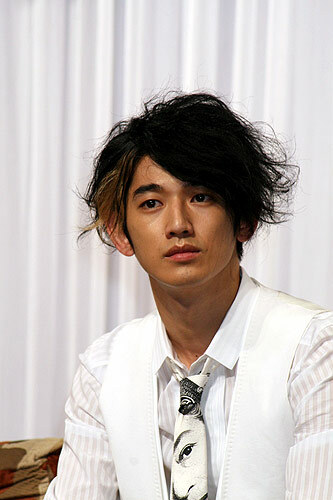 Eita, born as Eita Nagayama on December 13, 1982 in Tokyo, Japan, is a popular Japanese actor & model. He is the middle child in a family of five. His older brother, Tazuya Nagayama, and younger brother, Kento Nagayama, are both actors as well. As a young child, Eita enjoyed making home movies with his brothers, but he didn't dream of becoming an actor. Instead, Eita enjoyed playing football (soccer) during his elementary and middle school days. His entrance into the entertainment world then came about in 1991 when Eita was a high school student. While walking on the streets, Eita was scouted by a talent agent. He would then make his debut as a model. By 2001, Eita worked on a commercial for Coca-Cola which became popular with the youths and garnered Eita attention. In the same year, Eita made his acting debut on the small screen with the Fuji TV drama "Sayonara, Ozu-sensei" and on the big screen with "Blue Spring." The following year, Eita dropped his family name altogether and became known as just "Eita." During this time, Eita landed a variety of supporting roles, but didn't have anything stand out until the hit 2003 Fuji TV drama "Water Boys." Eita's starring role in the 2005 comedy "Summer Time Machine Blues," would further solidified his name as rising young actor. Along the way, Eita has picked up a variety of unique roles, switching just as easily from leading man to supporting actor and working in small indie films to big budget mainstream films. This has all worked to make Eita one of the more in demand actors working in Japan today. kun Oct 28 2018 9:34 am Eita is one of the best japanese actor!! doejo Oct 23 2018 3:31 am WOW! it's amazing how an actor can be overlooked in previous movies & dramas and all of a sudden you 'notice' them. This is how it is for me watching 'Segodon' LOVE this drama...and discovered Eita through his part in it. His handsomeness caught my eye and then I payed attention to him due to his great acting ability. I can now go and check out all the other dramas etc he has done and enjoy some more of this attractive and talented man. Ash Oct 16 2018 2:14 am Undoubtedly one of Japan's finest actor! R James Rivera Feb 02 2018 10:28 am I remember you from Orange Days as a best-friend character, but now that I watched you in Last Friends (Yeah, I know super late!!! ), I was rooting for you all the fu**ing way! My god, you can play any character! sendmylovetogyoten Aug 16 2016 3:55 am Eita, another mahoro series please... I love your chemistry with ryuhei. Thuy Oct 18 2010 7:07 pm I love EITA so much! I've become a crazy fan of him after watching " Nodame Cantabile, Last Friends and Hard to say I love you". Eita rocks! Here I wanna mention only the series " Sunao ni narenakute", my best fav one. I watched the series over 3 times with my brother and we both became fans of the series. It's really really good series with the good actors , esp Eita as Nakaji and Tetsuji as Linda , the beautiful sountracks and the intersting story. I've got to say that I'm absolutely satisfied to see so many scenes in which Eita and Ueno Juri are together, talking and laughing. They make the couple Nakaji and Haru seem to be born for each other, like a destiny. The acting of Eita here made a perfect impression on me. Eita possesses the eyes which expresses all his emotions . Thus, even though he doesn't need to shout or to cry, I can feel smoothly all the movements in his thought and emotional status. I've just watched another series of him, " Unfair", and he also did a good job in it. nonsibi Jul 07 2010 9:51 pm Kaela Kimura pregnant, getting married to Eita (Tue, June 1, 2010 (8:58am EDT) - Tokyograph) The entertainment world was surprised on Tuesday by the sudden announcement that actor Eita (27) and singer Kaela Kimura (25) are getting married. Kimura is currently in her fifth month of pregnancy and is expected to give birth in November. The news was broken by Nikkan Sports in the morning, and it was later confirmed on Eita's and Kimura's official websites. Their relationship was discovered last September. The two first met when they appeared together in the 2006 film "Memories of Matsuko," though they did not start dating until last August. According to Kimura's statement, the two have already decided to register their marriage this summer. She also assured her fans that she will not be retiring from singing. fan Jun 18 2010 10:48 pm eita-san omedeto on your wedding and your baby on the way!! :-) wish u the best and will keep supporting u!! nonsibi Jun 14 2010 2:52 pm I'm watching Sunao ni Narenakute, his outfits are pretty cool, represent a photographer. But I think he looks skinny, no six pack? doris Jul 30 2009 4:31 pm best young actor eveer!! !